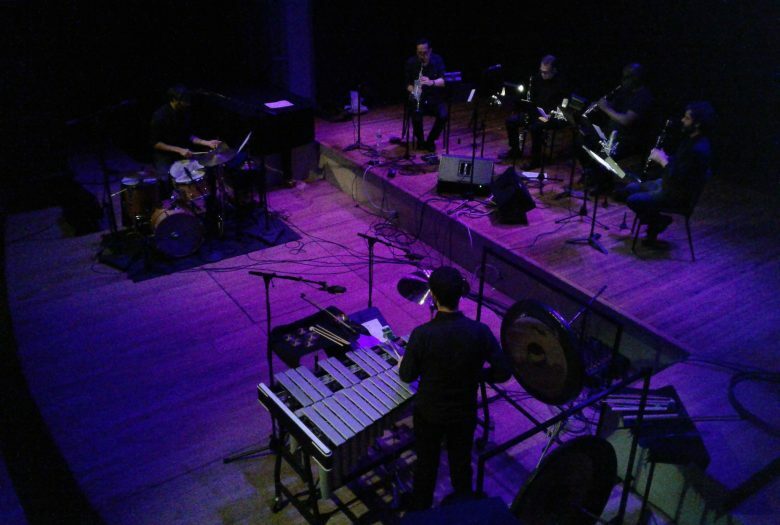 Composed in 2017, Jeremiah Cymerman’s Systema Mundtitotius is a hypnotic and mysterious concert length piece written as a concerto for two improvising percussionists with the accompaniment of clarinet choir. Employing a system of alternate fingerings and pitch specific electronic feedback, the clarinet choir surrounds the percussionists in a sonic environment that propels and informs the performances of the soloists. Drawing inspiration from and paying tribute to the writings and mandala drawings of Swiss psychologist CG Jung, the first iteration of Systema Munditotius took place at The Stone in New York City as the final performance of Cymerman’s 2017 week-long residency, with subsequent performances at Firehouse 12 in New Haven, CT.
For the past fifteen years, composer and performer Jeremiah Cymerman has become an increasingly integral part of the New York Downtown scene, charting a colorful career as a clarinetist, improviser, sound artist, recording engineer, archivist and podcaster. Frequently using the recording studio as a primary compositional tool, Cymerman’s work reflects a passionate interest in improvisation, electronic manipulation and production, as well as solo clarinet and ensemble performance practices. As a performer, he has worked closely with John Zorn, Toby Driver, Mario Diaz de Leon, Brian Chase, Christopher Hoffman, Evan Parker, Nate Wooley, Joshua Rubin, Anthony Coleman, Matthew Welch, and others. He has performed in over twenty countries as well as numerous cities in the United States, from grand concert halls to anarchist squats. Having released two albums on Tzadik Records, since 2012, he has been releasing music on his own label, 5049 Records, with six full length albums to date, featuring artists Evan Parker, Mario Diaz de Leon, Nate Wooley, Toby Driver, Peter Evans and others. Since 2013, via his 5049 Podcast, he has been documenting long-form, one on one conversations on a weekly basis with an increasingly diverse cast of the most important and distinctive living musicians.